These are the known facts in the Trayvon Martin-George Zimmerman case. Trayvon Martin was staying in a gated community had seen many robberies. As he was leaving a friend’s home, he was stopped by a neighborhood watchman named George Zimmerman. What was exactly said between the two we will never fully know. Neither did the jury that examined the case. Martin had no weapon on him at the time. Zimmerman was armed with gun, and from the police reports a fight had broken out between the two. Martin was described by witnesses as being on top and punching Zimmerman. Somehow, Zimmerman managed to get his gun and he shot Martin in the chest which immediately killed him. The jury ruled that while Zimmerman had made bad judgements, he had not broken any laws and was therefore not guilty of second-degree murder. Martin was equally guilty of making bad judgements by attacking Zimmerman, and this is what ultimately got Martin killed. Hence, Zimmerman was found not guilty of second-degree murder. In yet another case, a woman named Marissa Alexander had a restraining order against her husband who had threatened her and her children multiple times. He also had a police record for domestic violence. One day, Alexander’s husband had confronted her and threatened her. She pulled a gun and shot into the air. The jury found Alexander guilty of illegally firing a weapon and endangering the lives of her family. For this she was sentenced to 20 years. Her case is now on appeal. I am seeing racism on both cases in very strange and unlikely places. 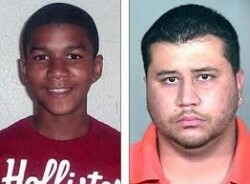 However tragic the Trayvon Martin-George Zimmerman case may be, I do not see race as a factor in what Zimmerman did. Yet I see plenty of racism and race-baiting in the actions of the Reverend Al Sharpton and his National Action Network for trying to portray the whole incident as “intentional murder” of a Black teenager. Even though the Federal Bureau of Investigation cleared Zimmerman of any possible hate crime, the U.S. Department of Justice, at the behest of U.S. State’s Attorney Eric Holder, may bring charges against Zimmerman. The American Civil Liberties Union, in an open letter to U.S. President Barack Obama, cautioned against bringing civil rights charges against George Zimmerman because it would put Zimmerman into double jeopardy and infringe on his constitutional rights. Meanwhile, Alexander remains in prison. Few people are protesting her case anywhere near as loudly as the Trayvon Martin case. In my view, the two cases share very similar circumstances, and Alexander’s defense lawyers have invoked the States of Florida’s controversial “stand your ground” law in regards to what Alexander did. Alexander’s lawyers pointed out that she had nowhere to run, was facing a person with a known criminal record for violence, and who might have threatened to kill her and her children. Given these circumstances, what else could Alexander have done? No one was killed in this case, and Alexander’s husband backed off from doing any harm. Yet, according to Alexander’s lawyers, the jury only saw a Black woman “who had committed a crime” and sentenced her to 20 years behind bars. Her lawyers are charging racism, and honestly I can see that. In the United States, there are too many cases where women are beaten and murdered by their former spouses or boyfriends—many of them women of color. I am sure that Marissa Alexander did not want to be another statistic. Sadly, her case is not receiving the publicity that the Trayvon Martin case has, and just as equally sadly the Trayvon Martin case is being twisted and turned by the political powers that be (including U.S. President Barack Obama) who are saying that Trayvon Martin was “murdered” by a “white” (that is not entirely accurate. George Zimmerman is Latino, and his ancestry also includes African Peruvian lineage from his Peruvian mother’s side). Yes, racism still very much exists, but not in ways that we may think is true.